Oxana Banshikova is a Bharatanatyam dancer and teacher based in Hong Kong. She began Cosmic Dance in 2009 to share her love of Indian classical dance with her Chinese community. Here, she reflects on her experience, and how Bharatanatyam is accepted and enjoyed across cultures. 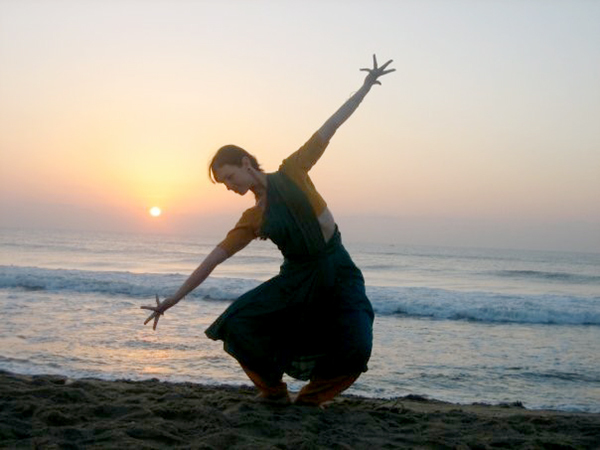 Can you tell me a little about your personal history – where and how did you learn Bharatanatyam? My name is Oxana and I was born in Kazakhstan. My dance journey started at a very early age with rhythmic gymnastics. Later, I tried a variety of dance styles, from ballet through contemporary and jazz, always searching for something different that would touch me in a special way. Many years later, I found this in Indian classical dance during a visit to India. With support from friends and family, I decided to try Bharatanatyam and was so mesmerized by it that I applied and was awarded a scholarship by the Indian Council for Cultural Relations (ICCR) to attend a four-year course at the Kalakshetra College of Fine Arts in Chennai. I successfully completed my studies in 2006. 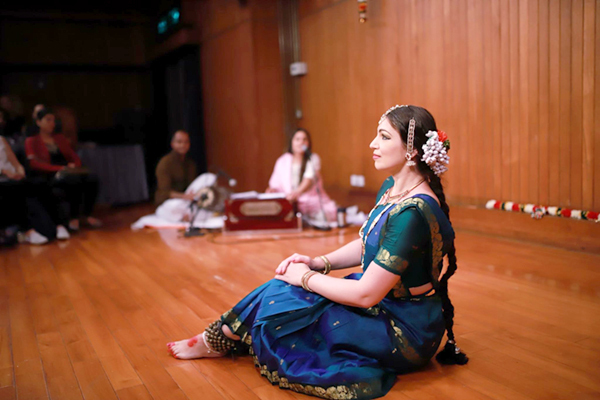 After enjoying a happy time of solo and group performances with my classmates in India, it was time to move on, which I dreaded as I had no idea of where I would go and if I would have any chance to teach or perform. What was the inspiration for starting Cosmic Dance? My husband and I ended up in Hong Kong solely because that was the first place that offered him a job. I had researched the Bharatanatyam scene in Hong Kong and, although there was not much happening, I was happy to find there was a friend of mine from Kalakshetra who was teaching there at the time. He was very helpful in telling me about the dance situation in Hong Kong and that most Indian classical dance forms are taught on a smaller, private group scale. I understood that my idea of working for a big institution would not materialize, so I started looking for other ways of continuing my dance career. Luckily, one yoga center was interested in hiring me as part-time dance instructor. Classes were open for walk-ins, so I had to rethink my teaching ideas and make it interesting for regular students as well as newcomers. That was the biggest learning curve for me and the most valuable experience of making this traditional art form into something that would be interesting for people who had never tried it. It was also really hard and frustrating to see people leave the class or be disappointed with not getting it straight away, because most people had no idea what kind of dance they were trying. After three years, I had built up a number of regular students who were interested in learning more about Bharatanatyam. I almost had no choice other than starting my own school so I could teach those interested students and take time to slow down and explore more theory and history behind this dance form. It was a really scary experience at the time, but it worked and those students who started with me 10 years ago are still with me and are more like a family than students now. How is Cosmic Dance structured today? At the moment, there are about 50 to 60 students ranging from 5 to 50 years old. I am the only teacher, so the number of classes is limited. We have separate classes for three levels: beginning, intermediate and advanced, as well as different days for adults and kids and also extra practice for the Cosmic Dance performing group, which consists of the most advanced students. Most students are female, but we have one really keen and talented male dancer. All in all, I teach around 16 to 18 hours a week, not counting extra rehearsals. 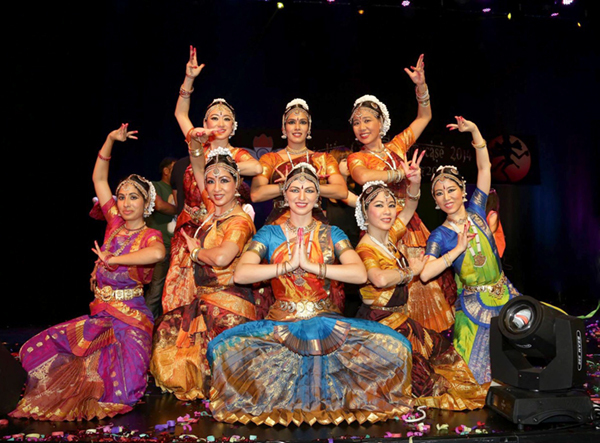 Was there already a Bharatanatyam community in Hong Kong when you arrived? How has it evolved in the past 10 years? The biggest problem in Hong Kong was (and still remains) that most classical dance teachers don’t stay long, so their students have had to go through the heartbreak of seeing their teacher leave and not having a replacement. Also, with style differences within Bharatanatyam, it is difficult to keep following different teachers. When I arrived in Hong Kong, many interested in Indian dance didn’t want to join, as they didn’t want to risk losing another teacher. Some people waited for a while before joining my classes. I had to pass a time test in a way. Now, after 10 years, it is much easier, as the name Cosmic Dance speaks for itself and people recognize it, so I don’t have to work so hard on promoting and advertising. We have also built up our audience and friends of Cosmic Dance who support our events. You’ve practiced Bharatanatyam in India, Kazakhstan, Armenia, and now Hong Kong. Has Bharatanatyam been welcomed differently in those different countries? In India, people have been exposed to classical dance for many generations, so there is no need to explain or introduce the concept. On the other hand, they have certain expectations about how it should look, how it should be taught, and how it should be performed. In this traditional environment, innovations are not so easy to introduce. In Hong Kong, even though people might not know much about Indian classical dance, they can compare it to Chinese opera, which has the dramatic aspect. 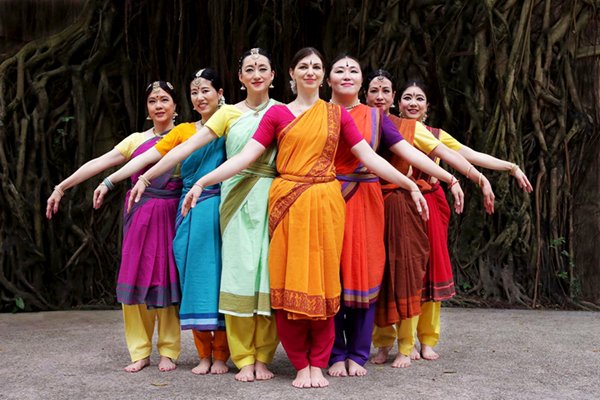 They can also relate to the religious and methodological stories behind dance, so there is fertile ground for Bharatanatyam to flourish among local Chinese people. In the local culture, teachers are also seen as significant and respected figures. That makes teaching very rewarding. The downside to Hong Kong is the high cost of living that makes studio rents unaffordable and, as most students are working overtime, they find it hard to find time and energy to commit. Kazakhstan is where I started learning Bharatanatyam dance. My first teacher is doing an amazing job promoting this form of dance over there. She remains as the only Bharatanatyam teacher. It is quite tough to compete with modern dance styles and, due to the small population, it is difficult to grow and build a big student base. On the other hand, people of Kazakhstan love watching and appreciate Indian classical dance. In Armenia, the concept was so new that people had never heard or seen anything like Indian classical dance, so they had no idea how to react, but the overall response was that it was ‘interesting.’ I didn’t spend enough time to form relationships over there, but hopefully some interest has sparked. One thing common to all places outside India is that I attract local students to learn Indian classical dance, as they can relate to me as a foreigner practicing it. How would you like to expand Cosmic Dance in the future? Cosmic Dance expansion started happening even without me thinking about it. Throughout the years, I have taught so many different people from different places, and when they have moved out of Hong Kong, we have stayed in touch. Now we have a truly global Cosmic Dance family; we can meet for performances and workshops in or outside Hong Kong. I hope Cosmic Dance can continue to grow in that direction and join more international festivals and get chances to travel as a group. My personal goal is that I want to continue with my research in preventing of injuries and rehabilitation for Bharatanatyam dancers, as well as to help students and fellow dancers to dance without pain. To learn more, visit www.cosmic-dance.com.